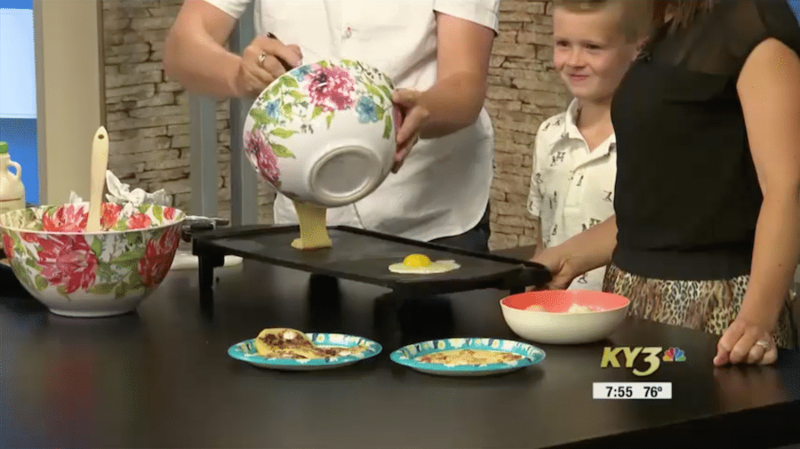 Chef Ryan Tiller and his two boys make delicious mancakes and corn cakes at KY3 Studios with Sarah Forhetz. These are a great treat for dad on Father’s Day, and we’ve included the recipes for you to re-create these at home any time! Combine all dry ingredients in a medium sized bowl with a pour-spout edge. Create a “well” in the middle of the mixture and add eggs, milk, and butter into the well. Mix until smooth. Heat griddle to medium to high heat. Grease with cooking spray or butter. Using traditional pancake batter, pour out desired sized cakes. Sprinkle each with Smores ingredients and fry flipping ½ way through cooking until both sides are golden. Serve with your favorite syrup. Heat griddle to medium to high heat. Grease with cooking spray or butter. Crack an egg onto griddle and allow it to cook until set. Use a spatula to keep egg formed into a circle as needed. Flip egg and then using traditional pancake batter pour rings of batter around each egg. Sprinkle bacon onto batter rings. Fry cakes flipping ½ way through cooking until both sides are golden. Serve with your favorite syrup. Combine all dry ingredients in a medium sized bowl with a pour spout edge. Create a “well” in the middle of the mixture and add milk, honey, oil, and egg into the well. Mix until smooth. Heat griddle to medium high heat. Grease with cooking spray or butter. Using corn cake batter pour out desired sized cakes. Sprinkle each with pulled pork, shredded cheddar, and onion and fry flipping ½ way through cooking until both sides are golden. Drizzle with maple BBQ sauce.